aquaponics Tanjung Sepat: What to drink in the morning at Tanjung Sepat? What to drink in the morning at Tanjung Sepat? Yes. P A S S I O N....to start the morning. 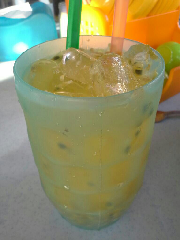 Passion fruit juice (with seeds) is my favorite drink for the morning. What to eat for supper @ Tanjung Sepat?